Alex Ford and Richard Kennett both welcome the renewed emphasis on knowledge within recent curriculum reforms in England, but are concerned about some of the ways in which the principle of a ‘knowledge-rich’ curriculum has been interpreted and transformed into particular pedagogical prescriptions. In this article they explain their reasons for endorsing a renewed emphasis on subject knowledge before setting out the implications that arise from such a commitment to the development of rich subject knowledge. 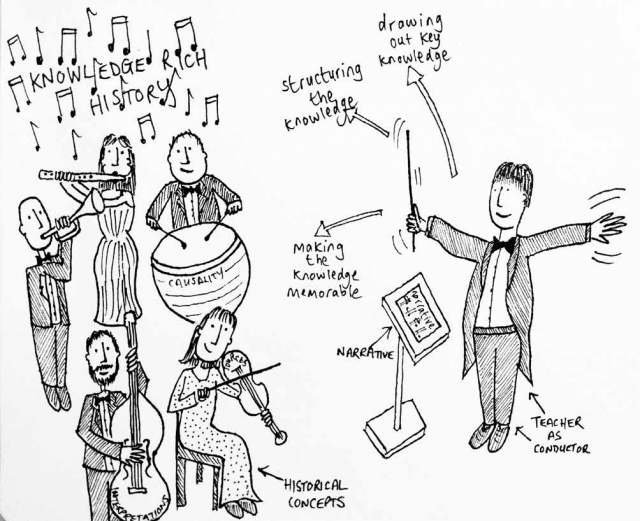 Drawing on examples from their own (recent and current) practice as history teachers and on an extended metaphor of the history teacher as ‘conductor’, they explain how careful preparation – in terms of the teacher’s subject knowledge – and attention to the way in which knowledge needs to be structured and brought to life for young people will enable a history teacher to orchestrate a rich symphony of historical learning that is both enjoyable and empowering.